The Funky Felter: 5 Super Cheap Things to Help Brand Your Small Arts & Crafts Business and Make It Look Big! 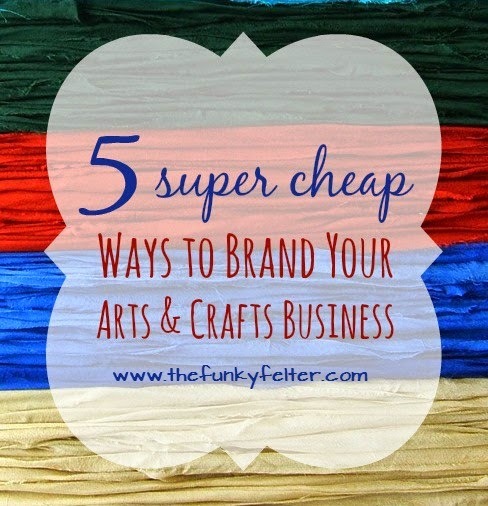 5 Super Cheap Things to Help Brand Your Small Arts & Crafts Business and Make It Look Big! Brand Yourself on a Budget! Get a logo! You need to have one consistent name and/or image (even if it is just your name in fancy lettering) to represent your business. This can seem daunting I know if you aren't that computer savvy. Well, my advice is... if you aren't a graphic designer or up on the latest graphic software, hire someone to make it for you. You might be thinking "Isn't that a load of cash to have done?" The answer is.... NO! Check on Etsy, ArtFire, and other handmade type websites for some great deals on logo design. There are some talented designers offering their services very cheaply on the side at these places. Take advantage of it if you need to. And, if you aren't a designer, please don't try to whip one up for yourself. A bad logo image can do more harm for your brand than you probably realize. Do what you do best and pay a little to have others do the rest. Trust me on this one. It is worth it! Get some business cards! There are several places online that offer a dandy little tool to help you design your own business cards quickly and easily. I personally like OvernightPrints and have used their services for a couple of years now and always been satisfied. I highly recommend signing up for their promotional emails too. It is totally worth getting a little spam for the great deals that they offer on a regular basis. You can often get a discount or 100 business cards for free with their promos. Another option is to have a business card size custom stamp made. You can simply stamp several new cards at once when you run low. Finally, if you are a little computer savvy, you can print your own business card designs on card stock paper. Be careful doing this though because they can look cheap and be flimsy, and you don't want your business represented as cheap. You just want to be cheap with your business budget. Get a website! This is the part that may really blow your mind. Take a deep breath! It is really not that complicated. You have a few options, some of which are even free. First of all, you can use your existing domain name to point to another location like your blog or your Etsy shop. If you plan to open up any other shops, like an ArtFire shop or etc., I don't recommend pointing the domain directly to your shop. A blog is a good alternative though. You can register one for free at blogger and other places. You can also easily design and modify your blog with side bar content and article posts. You can have links to all your other online shops and networking like Twitter and Facebook Fan pages. A blog can be a good home base that costs you nothing. Another upside to having a blog is that they are highly indexed by Google searches (especially blogger which is part of Google) and, therefore, you will be more easily found by others searching online. This is especially true for those who post regularly and use their titles and label keywords well. Another cheap option to a blog is a one page website that can be used as a home base. You will probably need to pay a little more with your domain registry though for actual web hosting if you go this route. If you check (um, you guessed it!) Etsy, ArtFire, or another handmade type site, you can find one page web designs for fairly inexpensive to purchase considering what an ad agency or freelance professional would charge you. If you go this route, do ask for references or examples of their work if they don't have it readily available. Also, ask them if they know about "SEO" and how to optimize your site so it is found easily in searches. Depending on what domain register you used, sometimes they offer free design templates for one page websites with your registry; therefore, you wouldn't necessarily have to pay for web hosting. And, although I am not very familiar with them, there are some free online design templates available if you search for them. I think that these would require some computer knowledge though as well as some design instincts to make them look professional and appealing. Unfortunately, I have seen arts and crafts websites that used free templates, and it has not enhanced their brand. Quite the opposite! So be picky about going that route. There you have it. From several years of selling online, that is the basic things that I recommend to get you started when you are also considering a tight budget and developing your brand. (A tight budget is usually all that I have to work with anyway!) I also recommend doing steps 1 - 5 as closely together as possible. If you do one little thing at a time, then decide to revamp your brand later on, it can be time consuming, costly, and difficult to transition. Think ahead and know how you'd like your small arts and crafts business to represent itself to the public. As an aside, there is one more thing that is totally free and invaluable in developing your brand. Time. If you are serious about making your small indie business self-supporting, you must be willing to spend quality time on it daily. This is so very helpful... Just have to work up the guts to go for it, eh?